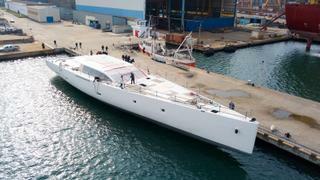 The first 42 metre hybrid sailing yacht in Perini Navi's E-volution line has arrived in Italy to complete construction. 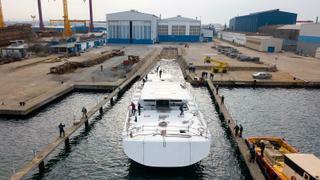 The yacht has been transferred to the yard's Viareggio facility after beginning construction in Turkey. It is scheduled for a 2020 delivery. It comes after the yacht hit the water for the first time earlier this month, alongside the yard's 25 metre all aluminium Eco Tender. The sailing yacht was sold to an “expert and enthusiastic” Italian owner in July last year and first announced at the Monaco Yacht Show 2017. The in-house design is built entirely from aluminium and features a lifting keel and naval architecture by the Reichel-Pugh studio. 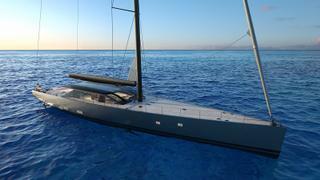 It also features a 2,367 square metre sailplan and includes a carbon fibre rig. The yacht’s exterior styling comes from Perini Navi’s head of design Franco Romani. 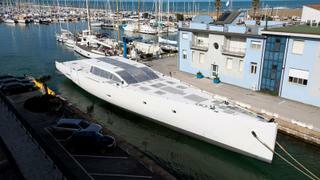 The yacht is the first unit from Perini Navi’s E-volution line, with the ‘E’ standing for electric. It features an innovative hybrid propulsion system that combines a main diesel engine and an electric motor as part of the shipyard’s commitment to environmental sustainability. This diesel-electric drivetrain will allow for silent cruising and a range of 3,200 nautical miles at ten knots, thanks to a total fuel capacity of 20,000 litres. Accommodation is for up to ten guests with a master suite aft, two guest cabins and a fourth cabin forward of the engine room. The layout also includes a bonus room that can be used as either a cinema or fifth cabin. The design features a folding transom door, which provides a sea-level alcove with staircase access on both sides. There is a flexible foredeck located forward with a Japanese-style dining pit. A dedicated sail drum storage unit sits below deck while carbon fibre helm pods sit aft. Meanwhile Tacoli also confirmed that the second hull in the line has been sold and is already under construction in Turkey.